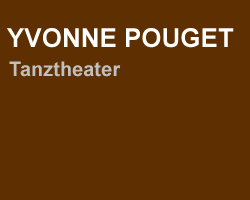 In her produktion Yvonne Pouget steps profounded down in the popular culture of Napels, full of spirit world and superstition. The daughter of an neapolitan father living in Munich connects withal her own inconoclastic smd unique choreographic hallmark with the body language and technic of her dancers Katharina Neuweg and Damien Liger, both trained in ballet and modern dance. La Smorfia is an book that details the Neapolitan tradition of interpreting dreams and everyday occurrences by associating them with numbers and then betting those numbers in the state lottery. And besinde it´s the namen of a bingo game. Because lots of the lower classes were illiterate at the time, there are several editions which use pictures as well as words to explain the numbers. The name La smorfia derivers form Morfeo or Morpheus, the greek god of dreams and sleep but the meaning is also grimace. The origins are linked at the Jewish cabala that uses numerology to assign to each name a number. The Smorfia is deep-rooted in Neapolitan culture. All time the simpel people from Napels have gathered around for this bingo, where the dreams are associated with numbers 1 to 90. La Smorfia allways helped the poor not to feel to be forlorn at the mery of fate. The board of the smorfia-bingo consitis of 90 numbers, Ech number is associated to more than ons symbol. One has to interpretate the story line of each dream very carefully to geht the right number. For example, if you dream of a Mother than play number 52. But ist his mother a mother who is game playing than it appointed to nuber 74 and the interpretation of the dream would be: „longing for the past.“ If the mother would be laughing, than is appointed to number 9 with the meaning: „prolificness“. In anny case Smorfia is an intricate science! The Tombola della Smorfia has the same rules like anny form of Bingo somewhere else. The gaming pieces first are shaken in a small basked and than they get shaken out. Each plaser has his playing card in front on the table, and who´s playing card is first completed has to shout „bingo“ and ist he winner. A time-honoreded tradition were Bingo events organised by transsexuals – the Feminellas- in her apartments. For this events- they do it to earn a living- the Feminellas cleared out her apartment for afternoons, for having enough space. The visitors mostly were the houswives from the quarter. The Feminellas like to use their creative powers to invent new obscene descriptions for the meaning of the winning numbers- just for fun and feeling more alive, and the interpretation are connected with the very spezial wacky, crazy neapolitan humor. This humor and a rich, sexually candid common speech is ingrained and important part of the neapolitan identity and expresses the yearning for feeling full of beans and happyness, even if you are poor. Smorfia is not just a game, it allways was a form of philosophy of the simpel people, to met his fate calmly and with a smile and wink. And to put a windmill for hope into the air. Old tradition are disappearing, and Pouget want´s to keep the traditon of smorfia and preserve it for loss. This produktion is a very personal profession of love to the inner world of her neapolitan grandparents and father, with you will see in the video. On Music like wine, inebriated, rhe girl and the young man (Katharina Neuweg, Damien Liger) play catch. They swirl and flutter around each other. They walz, they spin and jump, skirts flying, chest porudly lifted, eyes gleaming. In the back the old folks (represented by choreographer Yvonne Poget and conférencier Giacomo di Benedetto) are smiling. Ah youth, ah Napoli! Sun and Song and dance and amore! The food is rich, the pope is powerfull and life is all play ans enjoyment. One the one hand. What about sickness and poverty? What about loneliness, death, and unfulfilled desire? Life is a lottery. „and in Napels you can´t wait for it to find you“ says Yvonne Pouget whose familyhails fom there, „you have to go looking for luck.“ The journey is long. May God and ghosts help you! Like that one in a white frock. She, Pouget, sits on a chair, enveloped in darkness. Lifts her head. A baby face. she gets up, very slowly. 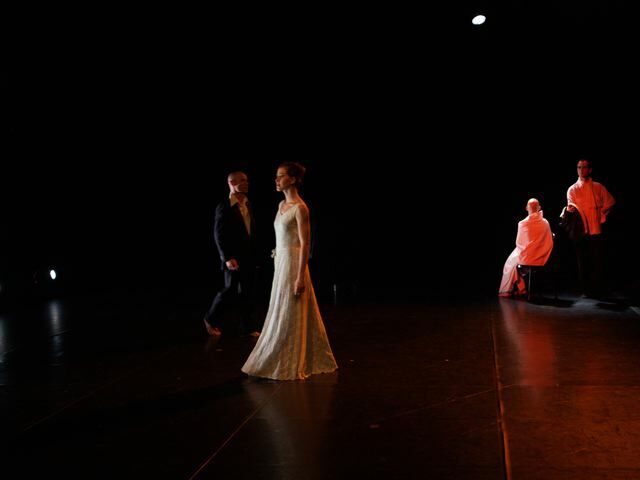 and she travels downstage at Butoh-pace. Indiscernible almost the transition from pudgy todder contentment to a child´s pouting, the coy flirts of youth, the sovereign dignity of mmiddle age, surprise then, disappointment, even suffering, oh! terrible pain, and finally a dimming down, a calmless, a shrinking; old age sets in. then death sneakes in up and takes her. Carries her away. A whole life unfolded and burried before us on a woman´s face and in her spare gestures. la smorfia means grimace. and besides it´s the name of a lottery game. For hundreds of years those deeply Catholic Neapolitans have gathered around for „la smorfia“: a bingo, where dreams are associated with numbers 1 to 90. „La Mamma“ is 52, if she is laughing, the number is 9, meaning fertility. The cat is 3, the cild is 2 and 89 „la vecchia“, ist he old woman. The lottery spans your whole life. From naked birth to naked death, throught hard times and warm summer nights. Pouget´s dance laboratory mirrors that. She concocts a lively mix of physical drama, folklore ans show, age old songs, heavy and melancholy, or gay as Tarantella. Giacomo Di Benedetto, accomplished singer-actor, is a Fellini character, sailing us from dark, mysticsolo to mating game duo, from the abstract birth sequence to a croaking, shrienking, nightmare creature of bobily decay.